The city owns existing fiber-optic infrastructure and plans to integrate its current resources into the new deployment. They’ll be adding about 100 miles of additional fiber to connect premises - including households, businesses, and schools - with both underground and aerial connections. In addition to existing streetlight conduit, Beverly Hills will add conduit for the project where necessary. SCE poles run through many of the city’s alleys and the community has been working on a pole attachment agreement so fiber-optic cable can hang from approximately 1,900 SCE poles. About 60 percent of the city’s parcels can be connected via underground connections. Construction will happen in phases and will likely start in the southeast part of the city; properties will be connected as construction in their area is completed. Beverly Hills has firmly established a goal to offer 1 Gigabit per second (Gbps) connectivity to residential subscribers for $50 per month. The city intends to offer the service to both single-family homes and multi-dwelling units (MDUs). Commercial tiers have yet to be determined, but will be offered in a variety of tiers. Recently, communities investing in Internet infrastructure have chosen to bypass video as part of services offered, but Beverly Hills feels they need to be able to provide both voice and video to meet certain financial targets. Beverly Hills will spend $19 million to deploy its network and has already approved vendors for the first phase, which includes construction, management, and equipment. They’ll use $10 million from the General Fund, which was already earmarked for the FTTP project in addition to internal loans from the city’s Information Technology funds and other city resources. Planners expect the network to run a positive cash flow in the fifth year and estimate it will pay for itself in 16 years. In a town known for its links to show business, it’s not surprise that the city has created media to spread the word about the project. In addition to fact sheets, Beverly Hills has created a couple of videos that describe why the project will benefit the community and what it will offer. 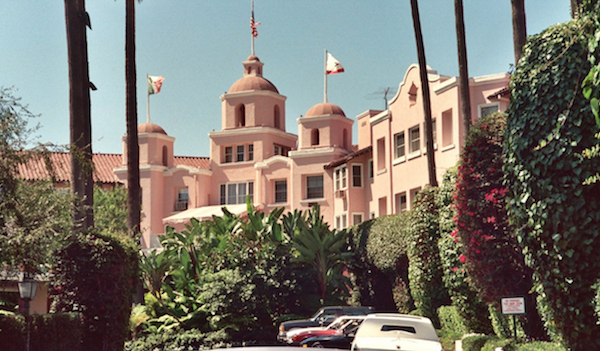 Image of the Beverly Hills Hotel by Alan Light (The Beverly Hills Hotel, 1989) CC BY 2.0, via Wikimedia Commons.